Ventilation, the movement of air in and out of the lungs, facilitates gas exchange. Therefore, the ventilation rate is vital in the regulation of the partial pressures of oxygen (pO2) and carbon dioxide (pCO2) in the blood. In order to maintain this, respiratory muscles must contract and relax rhythmically to alternatively fill the lungs with air in inspiration, and then empty them in expiration. In this article we shall consider the underlying mechanisms and neural control of ventilation. The muscles responsible for inspiration (the diaphragm and intercostal muscles) are skeletal muscles and so, unlike cardiac muscle, require nervous stimulation to trigger muscle contraction. Several groups of neurons, located in the pons and medulla are responsible for generating the rhythmic pattern of breathing. The cells bodies of these neurons form the respiratory control centre in the medulla, which sends impulses to stimulate the contraction of the diaphragm and intercostal muscles – via the phrenic nerve and intercostal nerves respectively. Once the neurons stop firing, then the inspiratory muscles relax and expiration occurs. Further information on the mechanics of breathing can be found here. Fig 1 – Diagram showing the respiratory centres of the brain. The rate of ventilation is tightly controlled through a negative feedback mechanism, and is predominantly determined by the level of carbon dioxide in the blood (pCO2). These levels are sensed by blood gas chemoreceptors, which are found both centrally and peripherally. Further information on chemoreceptors can be found here. As well as the involuntary control of respiration by the respiratory neuronal networks in the brainstem, respiration can be affected voluntarily by higher brain centres. Conscious control of respiration is via the motor cortex in the cerebrum, which receives inputs from the limbic system and hypothalamus. 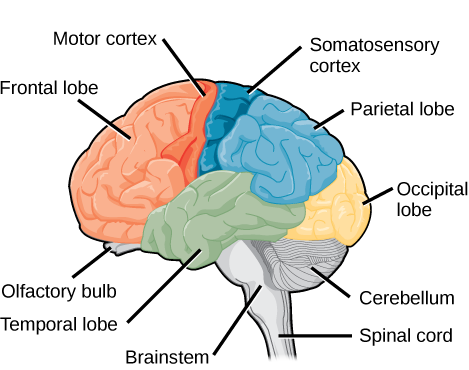 Fig 2 – Regions of the brain, neurons in the motor cortex are responsible for voluntary control of respiration. Persistent hypoxia is seen in many chronic conditions that lead to respiratory failure. Initially the hypoxia (low pO2) is detected by the peripheral chemoreceptors and stimulates an increase in the respiratory rate. However, this increase in ventilatory rate would cause a drop in pCO2. Central chemoreceptors would detect this and act to decrease the respiratory rate. In order to prevent this, the composition of the CSF is changed to compensate for the altered pCO2. This is achieved by choroid plexus cells, which actively secrete HC03 into the CSF. This returns the pH of the CSF to normal, and so the new higher pCO2 level is accepted as normal. The central chemoreceptors have become desensitised and respiration is now driven by the pO2 alone. Patients with chronic hypoxia can be managed with assisted ventilation, but should not just be given oxygen therapy. This is because the oxygen would increase their pO2, hence decreasing their respiratory drive. Their pCO2 levels would continue to rise, leading to hypercapnia and possible respiratory acidosis. Which statement about the muscles responsible for inspiration is incorrect? Where in the brain would you find the neurons responsible for involuntary control of respiration? Where in the brain would you find the neurons responsible for the voluntary control of respiration? What do choroid plexus cells secrete? Which statement about patients with chronic hypoxia is incorrect?